Some movies are merely tolerable, others like are feel good movies which are fun to watch but don’t have much substance or long lasting impact. 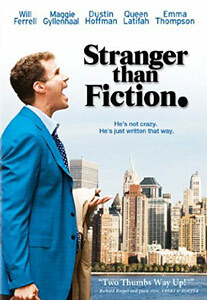 Stranger than Fiction is not a cookie cutter movie off the Hollywood production line, doesn’t have many flashy special effects, explosions or chase scenes but still manages to be more satisfying than other movies I’ve watched in the last year or two. As the lead character Harold Crick, Will Ferrell shows the audience that like Jim Carrey he is capable of playing a serious dramatic role despite making his reputation with crude comedies. Dustin Hoffman plays a literature professor who helps Harold analyse the path his narrative is taking and Emma Thompson is great as the reclusive chain-smoking writer Karen Eifel who narrates Harold’s life as it occurs. With some similarities to The Truman Show, Stranger Than Fiction examines the human condition, pokes fun at writers and “literary theory” about what constitutes a good ending and urges movie viewers to Carpe Diem (Seize the Day) and liven up their monotonous hum drum lives. One morning, a seemingly average and generally solitary IRS agent named Harold Crick begins to hear a female voice narrating his every action, thought and feeling in alarmingly precise detail. Harold’s carefully controlled life is turned upside down by this narration only he can hear, and when the voice declares that Harold Crick is facing imminent death, he realizes he must find out who is writing his story and persuade her to change the ending. I loved this movie. I thought the literary elements of it were reflected very well in the actual movie. Will Ferrel’s performance was understated and well-controlled, helping all the more the everyman-type character that was at the core of the movie/book. One of my favorite movies to come out in the last few years. Next PostNext Democracy 4 Sale – Whos Donating to Politicians?